There's only one game in town Wednesday (apart from the Brazil blame game) and that's the latest insight into Federal Reserve thinking on interest rates. 1. Fed minutes: The Federal Reserve will post minutes from its two-day June meeting at 2 p.m. ET. "That's the main issue that's going on," said Tom Beevers, chief executive officer of Stockviews.com. "The market expectations of when a rate rise is going to occur have been pulled forward. I think the minutes will be examined for any kind of hawkish tone." Expectations among some investors that the minutes could reveal a slight bias towards raising interest rates sooner rather than later may have contributed to Tuesday's market slide. "Bottom line is that a set of minutes that bore will likely boost equity prices," noted Steven Englander, a foreign exchange strategist at Citi. 2. Next big banking fine: Citigroup (C) is reported to be close to agreeing to pay $7 billion to settle a U.S. government investigation into the sale of mortgage backed securities. The deal would include billions in help for borrowers, according to the reports. 3. Market recap: U.S. stocks closed lower Tuesday as tech stocks took a beating. The S&P 500 fell 0.7% and the Nasdaq sunk 1.35%. The Dow Jones Industrial Average lost 118 points. There was a lot of excitement about the index cresting over 17,000 last week, but it finished the day a notch above 16,900. 4. Stock market movers -- Alcoa: Shares in Alcoa (AA) rose by 2% premarket after kicking off earnings season by beating analyst estimates. Otherwise, activity was thin, with U.S. stock futures flat. "Alcoa kicked off earnings and there was quite a positive reaction to the result," said Beevers, referring to an earlier uptick in futures. "I think that's generated a little bit of optimism in the market, that earnings got off to a good start." Shares in Gigamon (GIMO) were down more than 2% before the open, after plunging a whopping 33% on Tuesday. The technology company had lowered its revenue guidance for the second quarter. 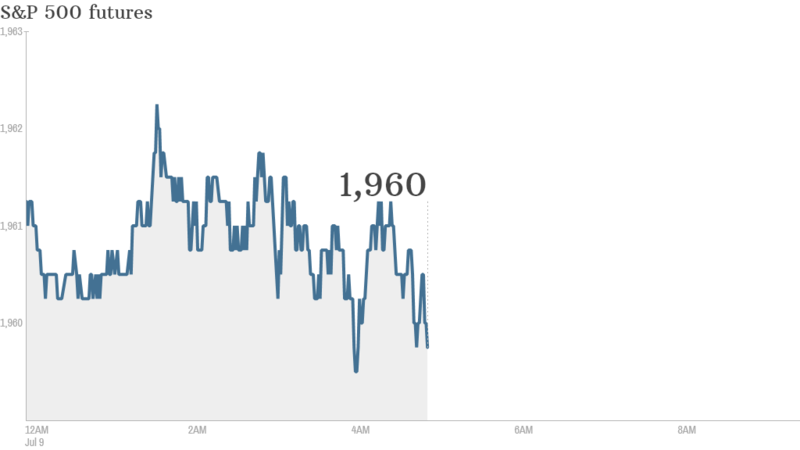 5. International markets overview: European markets began the day lower after Wall Street's weak close. Asian markets lost ground as subdued China inflation data provided more evidence that the economy is struggling to pick up pace after a below-target performance in the first quarter.